Would you make a good wildlife rehabilitator? Take our career test to find out how you match with this and over 800 other careers. What is the workplace of a Wildlife Rehabilitator like? When an animal in the wild gets hurt, sometimes human intervention can get them back to ideal health. A wildlife rehabilitator helps injured or orphaned animals recover so they can get back out into their natural habitat. Wild animals are very different from domestic animals, therefore a wildlife rehabilitator must have extensive knowledge about how to handle a variety of species. 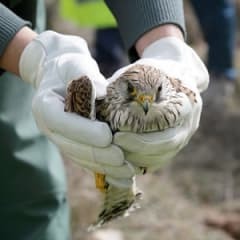 When an animal is admitted for rehabilitation it is usually because of human-related activities, such as a vehicle collision, nest destruction, oil contamination, or trapping. A wildlife rehabilitator will determine the extent of the injury and the probability of successful rehabilitation. If it appears that the animal can make a recovery and return to the wild, the animal will be nurtured and medically taken care of. Basic first aid and physical therapy will be administered to the animal, often under the supervision of a veterinarian. A wildlife rehabilitator understands behavioural issues, nutritional requirements, and knows how to safely handle and restrain the animals under their care. A wildlife rehabilitator’s focus is on the day-to-day care of the animal. They are responsible for feeding, cleaning up after the animal, and making sure they have a safe environment where they can recuperate. They keep detailed records of each animal, supervise volunteers, create fundraising campaigns, and provide educational demonstrations to the public. They also make themselves available to answer the phone if someone calls in about an injured or sick animal. Wildlife rehabilitators can work for government agencies, non-profit groups, humane societies, and zoos. Many times rehabilitators will gain the proper licensing and take animals into their private care. Many are involved in emergency response teams that travel to areas where there are distressed animals, such as wildfires, oil spills and hurricanes. Are you suited to be a wildlife rehabilitator? Wildlife rehabilitators have distinct personalities. They tend to be investigative individuals, which means they’re intellectual, introspective, and inquisitive. They are curious, methodical, rational, analytical, and logical. Some of them are also artistic, meaning they’re creative, intuitive, sensitive, articulate, and expressive. Does this sound like you? Take our free career test to find out if becoming a wildlife rehabilitator is right for you. Wildlife rehabilitators work within facilities or out of their own homes caring for the animals. Some of the work can be very routine, repetitive, and messy, depending on the type of animal. Some animals are more volatile than others, and the rehabilitator will need to know how to assess and safely manage each situation.